Majority of children these days, spend time using gadgets like mobile phones, tablets, and computers. This makes them lethargic at an early age and also leads to slower metabolism causing obesity. It also slows them down mentally, hampers their creativity and impacts their overall development. Due to staying indoors all the time, children become shy and introvert and have a difficult time interacting with others socially. An ideal way to counter this is to ensure your child gets involved in an activity that gives them sufficient physical movement. And compels them to go outdoors and make friends with like-minded people. Children who learn a creative art at a young age develop a keen eye for detail. Art transcends culture and language. Creative arts help children develop an appreciation for different cultures and communities at an early age. Photography is one of the activities that will give your child a creative outlet. They find a way to express themselves through the shots they capture. They get close to nature. They learn to appreciate and respect nature when they are young. Photography is a creative outlet for your child. Here is a list of a few tips to keep in mind when you teach photography to your child. While it is natural for you to want a creative outlet for your child, it is equally important that you let your child find a creative art on their own. It will be easier for you to draw them towards photography if you let your child have a hands-on experience with the camera on your mobile phone (which they use under your supervision) or you can show them photographs clicked by you. You can take portrait shots of your child and show them how they can capture similar photographs. It also makes sense to first get your child interested in photography before you invest money in purchasing a camera. Once your child is keen on learning photography, figure out which camera is best suited for them. Their age would be one of the key factors for your choice. A kid’s camera would be best suited for a small child as they are designed keeping in mind the size of a kid’s hands, their limited capacity to carry weight etc. They are sturdy despite being lightweight. And the functions on a kid’s camera are limited so that the child doesn’t get too confused. If your child is older, you can consider purchasing an action camera for kids. If you have an old camera, which is still functional, you can give that to your child. It will be easier for you to teach photography to your child on your old camera as you are familiar with its features. Giving your child use a camera that is used solely by them will give them a feeling of ownership. Teach your child about the features of the camera. If your child is small, explain to them that they must not cover the flash or the lens with their fingers. If the camera has a lens cover, ask your child to put it back on after they are through with taking photographs for the day. Keep in mind not to over-teach your child as they will only get confused with excess information. If your child is older, you still need to take into account that they are a beginner. Therefore it would be best, to begin with, basic tricks and then proceed further to more complex features once your child gets better with their skill. Photography is a creative outlet for your child. However, in the beginning, you need to shape their thoughts and give them a direction, so that your child can express themselves better. You can begin with teaching them to focus on a particular object, observe how the light is falling on it, then view the same object through the lens and decide which angle is best to highlight the beauty of the object. Explain to your child that just clicking the shutter release button and clicking a random object isn’t enough. They need to learn to click a photograph with a purpose so they can describe the moment that they captured in the frame. At the end of each day, you can sit with your child and go through all of the photographs they have clicked. Don’t miss a single chance to appreciate your child when they have clicked on a good photograph. Your child will feel immense pride when your praise their work. It will give them a feeling of accomplishment. But also, take an effort to tell them how they could have captured a photograph better. Or how you would click it and explain to them the reason how and why you would click it differently so your child can have a better understanding of what they can do to improve. Your involvement and feedback are very important to your child as they come up the learning curve. Learning photography will help your child to capture emotions and many priceless moments that will love to reflect on when they are older. You can create a digital album of some of your child’s best shots. If your child is good at photography, you can enroll them in photography contests in your city. This will be a positive reinforcement for your child and increase their confidence. They will get an opportunity to meet people with similar interests. Photography is a great way to enhance the experience of an otherwise mundane activity. It is a good stress buster and helps your child unwind from their routine activities. Photography not only helps you freeze a memory in a frame but is also clinically proven to boost memory and keep the mind active. Your child will develop an eye for detail and learn to be aware of his surroundings. Dan Barr is a photographer, a parent to two girls, and the founder of KidsCameraGuide.com, a blog which is all about teaching photography to kids and kids cameras. You can visit Dan at his website www.kidscameraguide.com. Cool tips! They will be really helpful for beginners as well as for children who’ve just started their photography journey. I’m absolutely in for choosing the appropriate gear and involving in some interesting activities. It can create the background for professional engagement in future. Love your 5 tips! 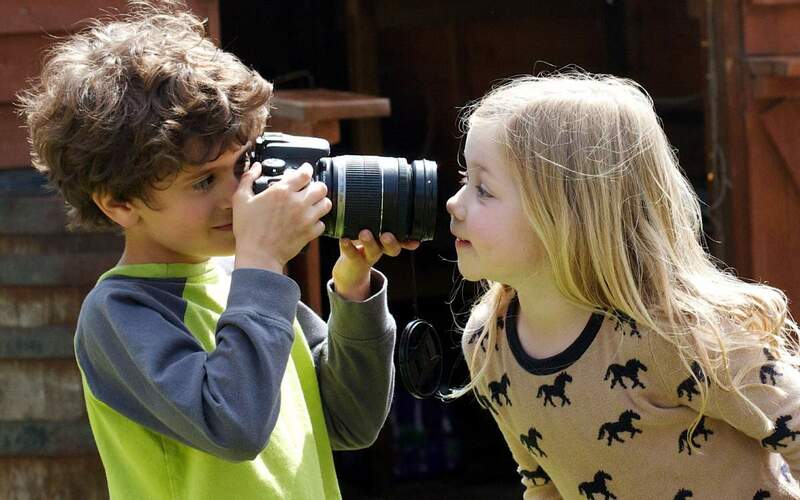 Introducing photography to children is a great way to get their creativity flowing and also help them build self-confidence. Not to mention it is a fun life-long hobby…or a possible career path.